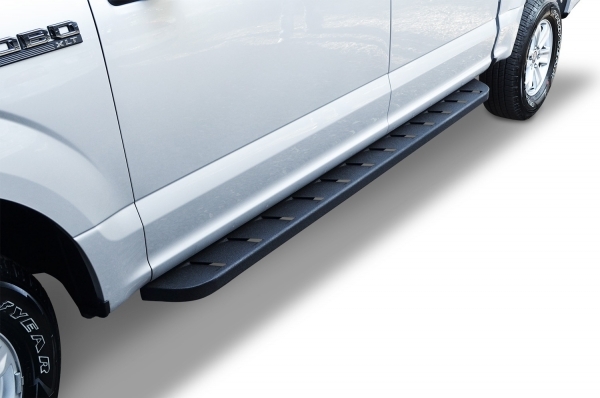 RB10 series running boards from Go Rhino protect your paint from flying stones and gravel while providing a wide, full-length step platform for easy entry to the front or back doors. These Raptor-style running boards are built from 16-gauge, zinc-coated steel and are sprayed with a durable black textured finish for corrosion, impact, and abrasion resistance. The Expedition is a cargo storage sling that will attach anywhere along the rails of the truck bed, providing quick and convenient storage that can be removed in seconds. The Expedition offers you the utility of a toolbox when you need the extra storage. This rail-mounted cargo bag boasts 8 cubic feet of extra storage. It’s easily installed and fits most truck beds. This weather-resistant cargo bag comes with plastic floor panels and inserts for custom organization, and also sports an open pocket in the front. Lund’s Terrain HX Step™ is an aggressive but functional nerf bar that provide a rugged off-road look and allows easier entry and exit. The design adds rocker panel protection from road debris and helps guard against door dings. 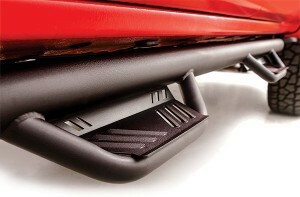 <p>Lund&#8217;s Terrain HX Step™ is an aggressive but functional nerf bar that provide a rugged off-road look and allows easier entry and exit. 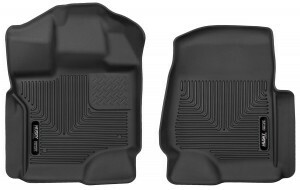 The design adds rocker panel protection from road debris and helps guard against door dings. 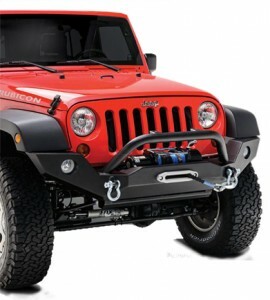 Paramount Offroad’s new full-width Xtreme Offroad Crawler (XOC) series bumpers are designed for the urban trailer looking to upgrade his factory bumper for off-road capabilities while retaining a factory appearance. <p>Paramount Offroad&#8217;s new full-width Xtreme Offroad Crawler (XOC) series bumpers are designed for the urban trailer looking to upgrade his factory bumper for off-road capabilities while retaining a factory appearance. ReadyLIFT® Off-Road Suspension is proud to announce a new lift system for 2014-2015 Ram 2500 4WD Series diesel short bed trucks. 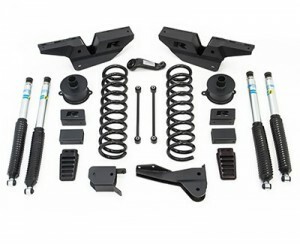 This exciting new lift system is made in the U.S.A., provides 6″ of front lift, and features the best engineering technology you will find on the market today. The 49-1600 series uses performance front coil springs that provide a true 6 inches of front lift. In the rear, proven spacer technology teams up perfectly with the factory rear coil springs. This new system includes a lift structure that will enhance the overall factory ride while greatly improving off-road performance. Along with performance springs and spacers, the ReadyLIFT engineering team also developed rugged frame-mount radius arm drop brackets that reposition the factory radius arms back to the factory position. This retains OEM alignment geometry. They even included front/rear bump stop extensions to prevent over-compression during off-road use, and Bilstein 5125 Series shocks. The 49-1640 is designed specifically for 2014-2015 Ram 2500 4WD trucks with diesel engines, and will allow for increased tire packages up to 37″ x 13.50″, and 9.5″-wide wheel sizes from 17″ to 20″ in diameter. Getting into your truck shouldn’t feel like climbing Mount Everest. 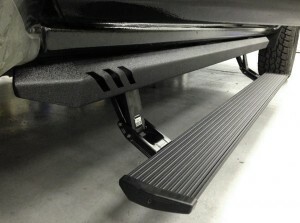 AMP Research™ has released the PowerStep XL™, an automatic, electric-powered running board designed for lifted trucks. The board has been integrated into a custom rocker rail, creating a seamless look while providing a stepping surface that is 3″ lower than the original PowerStep™—making accessing lifted trucks easier. Fully Welded/Integrated Bracket System Supports up to 600 lb. General Motors’ 305-horsepower, 3.6-liter LFX V6 engine is found in several Buick, Cadillac, and Chevrolet models—including the Chevy Camaro. When equipped with this engine, the 2015 Chevy Colorado and GMC Canyon are the most powerful mid-size pickups currently available in North America. Even though they beat the competition by more than 40 horsepower, there’s never any harm in improving performance—especially when it’s as easy and rewarding as bolting on a K&N performance intake system. K&N’s 63-3088 air-intake system frees up large amounts of power by replacing the restrictive factory system with a free-flowing, roto-molded, black HDPE air intake tube; a high-flow, chrome-top conical air filter; and an application-specific heat shield to protect air entering the filter from engine heat. 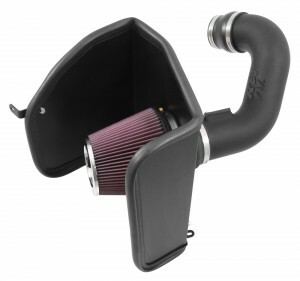 Whether your 2015 Colorado or Canyon 3.6L V6 is used as a reliable daily driver, a dedicated workhorse, or something in between, this air-intake system will provide increased performance with better engine sound for years to come. Not legal for sale or use on any pollution-controlled vehicle in the state of California. Bigger and better. That’s how Superchips describes the TrailDash2 (TD2). In addition to the new, slim case design, it was upgraded to a 5” full-color display—making it the sleekest in the industry. Superchips didn’t stop at making the display larger; they also made it better with a high-resolution screen. To complete the streamlined look, Superchips engineers added a simple HDMI-style plug for power and linking EAS accessories. Engage your lockers, bypass TPMS, and more with the Rubicon screen! 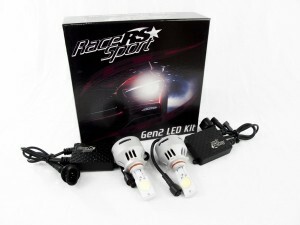 The all-new EAS switch screen enables you to engage your lights and other mods on your 2003-2014 Jeep.